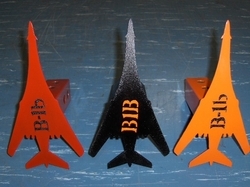 B-1B Tow Hitch Covers $30. 14 gauge steel cut-outs made to fit any class receiver hitch. Powder coated to any color you pick. Over 70 colors to choose from. 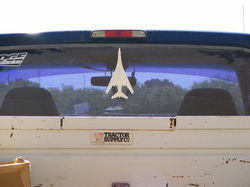 14 gauge steel cut-outs with 3M Molding Tape to attach to your vehicle or window. Powder Coated to any color you pick. Over 70 colors to choose from. 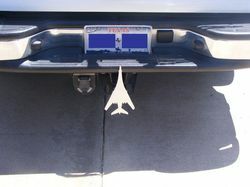 Call or email for more information about the Hitch Covers or about getting something Powder Coated. Wrinkle Black with Orange Lettering. Hitch Cover positioned to be installed at an angle as shown. 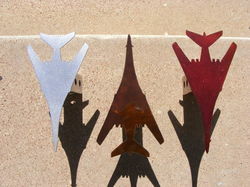 Powder Coat Metallic Silver, Candy Orange, and Metallic Red. 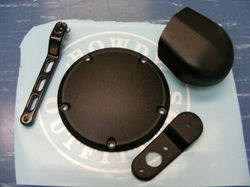 Harley Parts Powder Coated Wrinkle Black and Semi-Gloss Black. 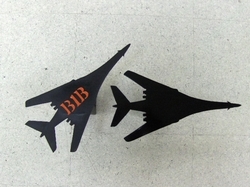 B-1B Silhouette mounted on Rear Window.